I love to mix fabrics for texture and interest and I love to take a table runner and scrunch it to add extra interest to a table. I also like to take a table topper and scrunch it for a little drama. That started me thinking about other places to add a little softness. 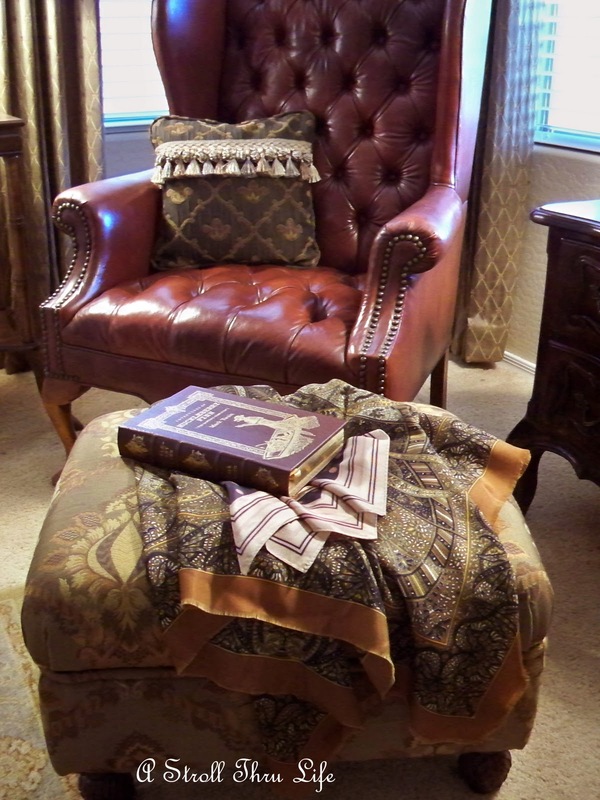 This is an ottoman that I made. It's great to prop your feet up on or as an extra seat when needed. I love this fabric and it coordinates with the colors of my drapes and the area rug, but maybe I can change it up a bit. So I started playing with the new shawl I found and a scarf I already had. They add a little interest to the ottoman, and give it a sense of being a little more casual. All of the colors work well together and the mix of prints are fun. I pulled out two more scarves and played some more. Two different polka dots. A houndstooth and a paisley. Pull out some of those scarves you don't wear anymore and use them in your decorating. How fun would this be to use on a table, buffet or any number of places. Do you have a ton of scarves just laying in a drawer? What can you think of to do with them? If I could only reach through and grab that houndstooth, that is gorgeous! I love what you did and all of the possibilites, you have a lovely eye for prints! I don't think I can scrunch like u!! The new purchases look great on the ottoman! When I scrunch, it looks like I just didn't have time to "fix" things. Isn't fabric fun, and it can make such a big change in your decor. I love it Marty!! 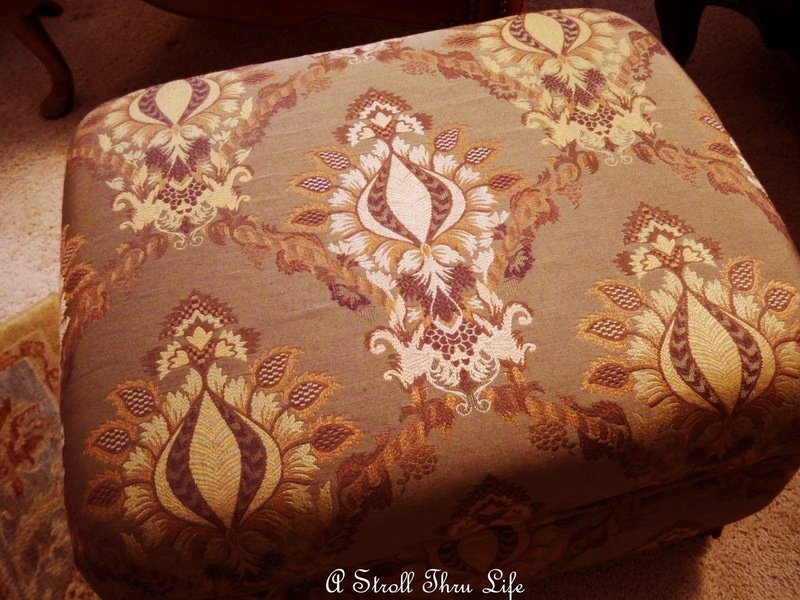 Your ottoman is so pretty how did you make it? Love all of your scrunching of fabrics you create beautiful things. Your choice of fabrics are so pretty and rich looking. Marty, great soft scaping. I love the look with the scarves. Good idea. 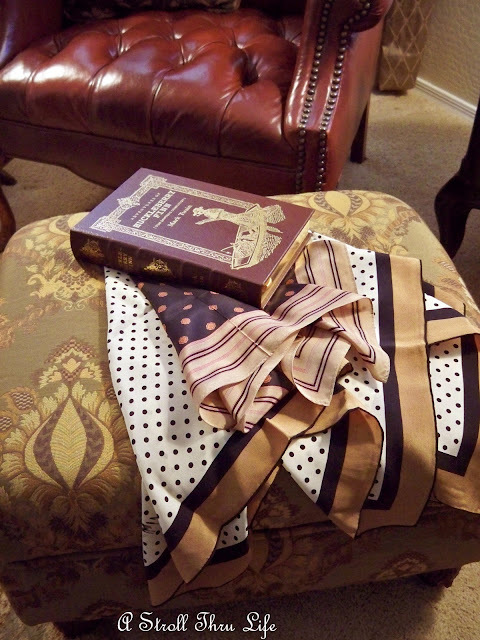 I pulled out some scarves I had around Halloween and laid them on my coffee table. It did add a nice touch of color. Great photos! What a great idea Marty! I do have tons of scarves I don't wear. I love the photos...looks like you were just sitting there relaxing and on a whim just tossed off your scarf and set the book on it and went off on some new adventure! What a great idea Marty!!! I would have never thought to do that, but all your combinations are beautiful. If my scarves were as pretty as yours I would pull them out for sure! I love everyone of those. That's really a great idea and yours match your home beautifully! This is so fun, and I love the combinations you came up with! I have to say that it has NEVER occurred to me to "scrunch" a table runner, but you know, with four kids, they NEVER stay flat, so maybe a "scrunch" would be a GREAT thing to try around here! Pillows are a lot of fun! The scarves look great! I love your ideas! 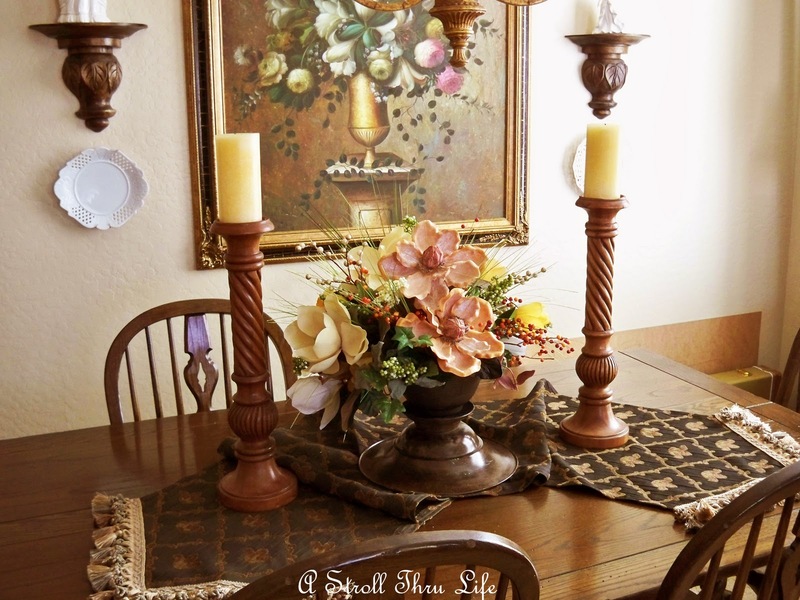 I have used scarves for table runners in some of my tablescapes. Better than having them hidden away in a closet somewhere! What a great look you have achieved using scarves. I have to see if I have any scarves hiding in drawers. Looks amazing...as always. I've always loved how you scrunch and use fabric...scarves are great for this! I also love throws over my furniture...it makes the room look so cozy. How fun! 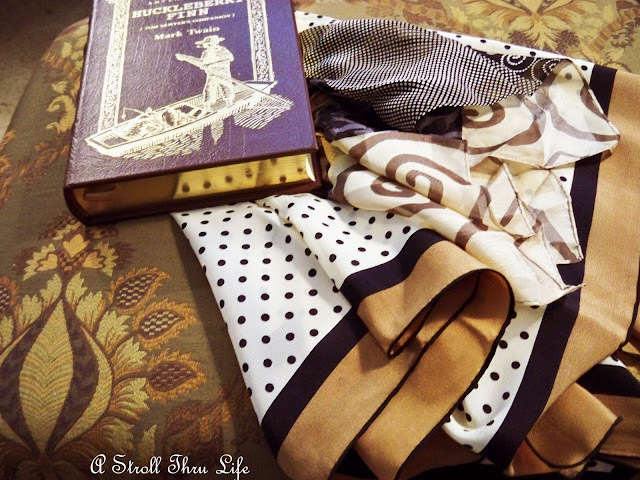 I have a scarf on my tablescape today...I've done that several times. I have scarves and now I have some of my mom's...yet I rarely wear one! 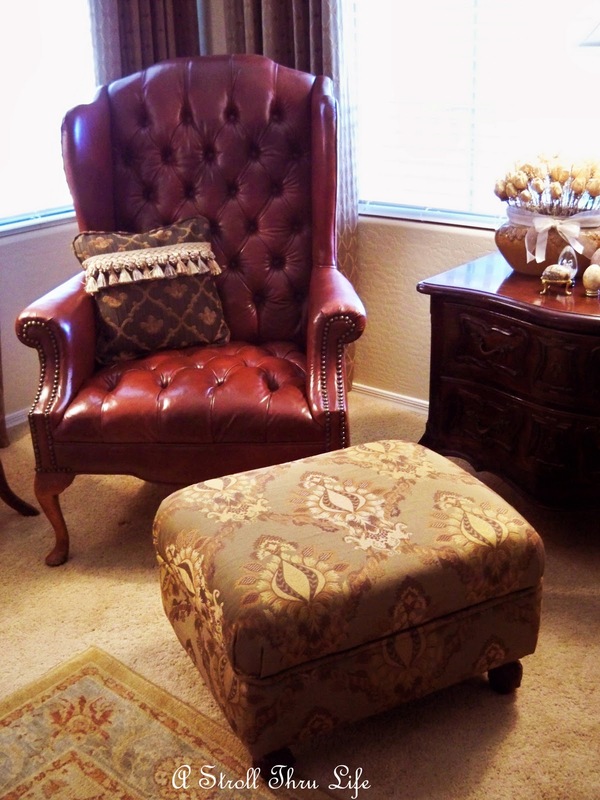 I love that sweet little ottoman. Using the scarves is such a good idea and maybe something I can do with many that I have. When my MIL down-sized awhile back she gave me bunches of scarves, which I love! Oh how fun! Your scarves look so pretty -- and I do have a big old drawer full! Very pretty Marty. I have some great scarves sitting around. You have me inspired! Oh, Marty, I have been looking for a tufted leather, wing backed chair just like the one who featured today for a few years. I can't find one. Anywhere! Please tell me where you purchased yours. Please? Thank you! Marty, you just have the eye! If I tried to do this, my husband would say, "You left a mess on the ottoman"
But I'm going to dig through this house for some things to soften up areas around here anyway. I love the look of yours. I love it too Marty! It adds interest and the unexpected to a room. Nice job! 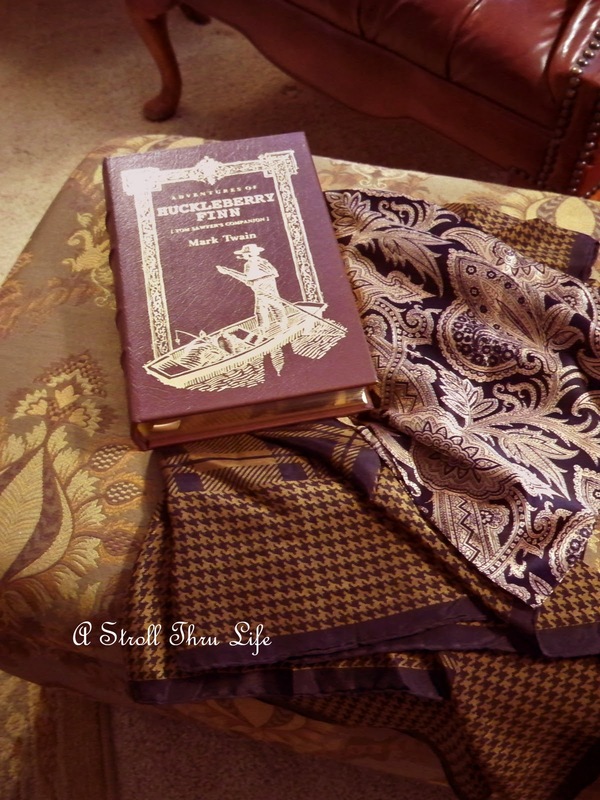 I'm USUALLY a staight~laced lady. . .meaning if I put a runner on the table, it would be freshly pressed, starched stiff and straight as could be. HOWEVER; every since I've been following your blog. . .I scrunch! WoW! What an elegance scrunching adds to a table, arm rest, on a couch, or a footstool, anywhere! It gives a flow of movement to a room that somehow says," Yes. . .people really do live here!" I adore the new paisley shawl and that houndstooth is probably telling my age, but it's so classic! Thanks for sharing this great idea of scrunching fabric in home decor today! It looks so cozy!! 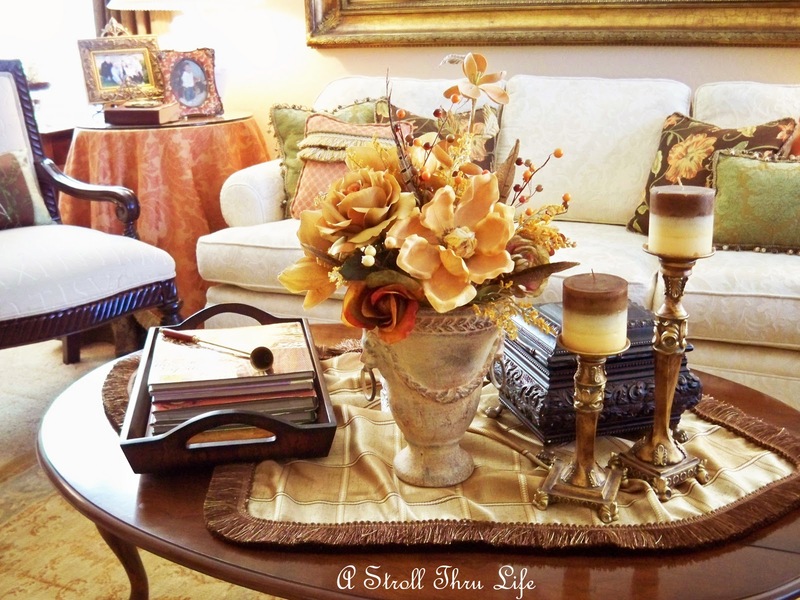 I too have scrunched my coffee table topper- love it! Oh, one thing.. I don't know why this is happening, but when you leave comment on the "feeder" it's going to my email instead the bog and I can't put it on the blog. So, in case you want to show your comments I'd recommend you to comment on the blog, if you prefer, ok? I just love to hear what you have to say about my post.. I love when you give your opinion. Lovely as always, Lady, and this is something I could easily steal. 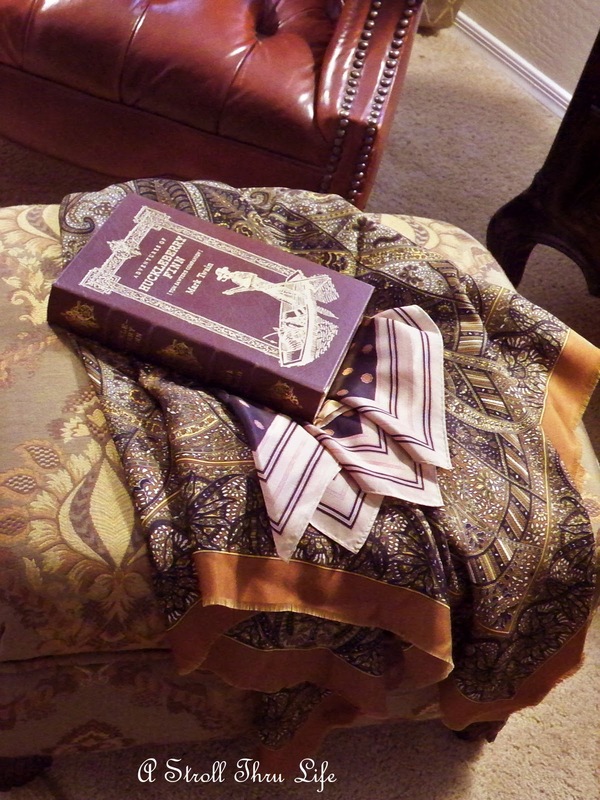 It's amazing what a different each of the scarves makes as you placed them on the ottoman. Good lesson in thinking outside the box. Beautiful scarves,love what you did with them.